The beautiful Neo-Gothic architecture of our church makes for an attractive location for couples who intend to marry in Christ. We also offer the use of our church hall for refreshments. Birmingham skyline and green spaces opposite the church's main entrance will provide a suitable background to your wedding photos. A brief free-of-charge course of preparation with a priest may be required ahead of the wedding. To arrange your wedding please contact Fr Gerry (Phone: 0121 440 0404; E-mail: frgerrysykes@gmail.com). 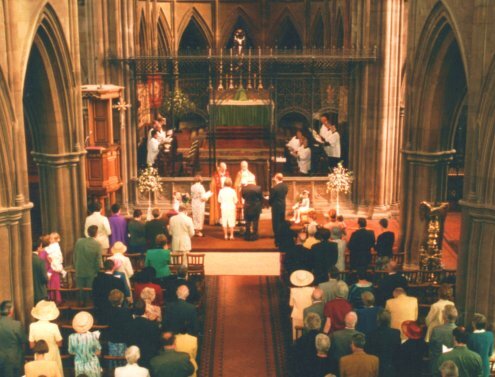 If you live in the parish and plan to marry in a Church of England church elsewhere, you may need to have banns called (a public notice of your intention to marry read in church) at St Alban's for three weeks before your wedding. You can follow this link to see a map of the parish bounderies. If you think this applies to you, please contact Fr Gerry (Phone: 0121 440 0404; E-mail: frgerrysykes@gmail.com).